In a Monaco Grand Prix hit with retirements, Mercedes driver Nico Rosberg managed to stay ahead of team mate Lewis Hamilton. The silver arrows duo was followed by Red Bull's Daniel Ricciardo and Ferrari's Fernando Alonso. Under a rather cloudy sky, the Monaco Grand Prix kicked off with a problem for Pastor Maldonado as the drivers started their formation lap. Team members pushed the car to the pitlane and tried to solve the problem in order for the Lotus driver to start the race. As the lights went out, Nico Rosberg was able to stay ahead of team mate Lewis Hamilton, Sebastian Vettel and Kimi Raikkonen, who had an incredible start. Maldonado is listed as the first one to retire the race, unable to get his Lotus E22 going. Just before the hairpin, Sergio Perez was hit by Mclaren driver Jenson Button and was forced to retire after hitting the barriers. After less than 1 lap, the safety car was already out on the narrow street circuit. In lap 4, we went back to racing and immediately it appeared that Sebastian Vettel had an issue with his car as drivers rushed by. The German enters the pit as mechanics try to solve the problem. In the meantime, Lewis Hamilton is trying to stay near front runner Nico Rosberg as both Mercedes drivers take a 3 seconds lead over Ferrari's Kimi Raikkonen. In lap 7, Sebastian Vettel gets the message to bring the car back to the pits to retire the race with an ERS issue. Only 5 laps later, we have a new retirement as Kvyat remains in the pits. Not a good day for Red Bull and sister team Toro Rosso, or so it seems. Adrian Sutil, who pulled the stunt before by passing Romain Grosjean, executed another of his trademark hairpin moves and passed Ericsson. The German proves that it is possible to overtake in the narrow streets of the principality. Only one lap later, Sutil moves up to place 15 after an overtaking move on Chilton at the Nouvelle Chicane. Bianchi, Chilton, Guttierrez all receive a 5 seconds stop/go penalty for being out of position on the grid. Rosberg is now 1.3 seconds ahead of Hamilton. The lead for the Mercedes duo over Raikkonen seems to increase every lap and is 10 seconds in lap 23. This seems another "easy" day for the silver arrows team. The aggressive style of Adrian Sutil results in a crash coming out of the tunnel. After 3 brilliant overtaking moves, the German is forced to retire and once again the safety car is out on track. Time for a lot of drivers to return to the pits. Nico Rosberg, Lewis Hamilton and Fernando Alonso are among them. During the busy period in the pitlane, a crash during Vergne and Magnussen could be just avoided after an unsafe release from the Toro Rosso driver. It looks like this will be penalised by the stewards. On lap 28, still driving behind the safety car, Lewis Hamilton demands answers from his team. The Briton wants to know why he wasn't called into the pits one lap earlier. In the meantime, Kimi Raikkonen came into the pitlane for his first stop and rejoins the pack in 13th place. In lap 30, the lights on the safety car go out and it's back to racing. Nico Rosberg takes his time to cross the line and tries to stay ahead of team mate Hamilton. Ricciardo is now in third position and is still followed by Fernando Alonso in his Ferrari. Only seventeen drivers are still in the race. In lap 34, Lewis Hamilton set the fastest lap and the Briton is now less than a second behind his team mate. Jean-Eric Vergne receives a drive through penalty for the pitlane incident with Magnussen. The Frenchman is currently in 6th position, so this penalty will really hurt him. Vergne rejoins the pack in 13th position while Kobayashi gets warned about cutting the chicane. In lap 40, Nico Rosberg gets a message from his engineer to keep an eye on his fuel usage. The German has used the most fuel from all drivers in the top 10. In the midfield, Felipe Massa is still in a good 5th place after starting the race in only 16th position due to his collision during qualifying session yesterday. The Brazilian seems in good form in his first of two "home races". The Brazilian is followed by Nico Hulkenberg, Magnussen, Button, Bottas and Gutierrez who completest the top 10. Felipe Massa pits in lap 46 and rejoins the pack in 11th place, just behind Kimi Raikkonen. On lap 52, only 16 drivers remain in the race as Vergne is forced to retire with what seemed like an engine failure. And Vergne was not the last one to end the race prematurely as also Bottas had smoke coming out the rear of his car. The Williams of Bottas remained parked in the hairpin, but the Monaco stewards were very quick to lift the car over the barriers in order to avoid a new safety car period. In lap 61, the Sauber of Guttierez spins after hitting the barrier with his rear tyre at Rascasse. The stewards do everything in their power to clear the track as soon as possible. In lap 66, the pitstop crew of Mercedes make themselves ready as it appears that Lewis Hamilton has a problem. The Briton loses 3 seconds in one lap and is now 4 seconds behind Rosberg. Hamilton however decides not to enter the pits. In the meantime, Bianchi gets another 5 seconds stop/go penalty as he served his previous penalty under the Safety Car. With 8 laps to go, the race engineer of Hamilton informs the Mercedes driver that he has a 9 seconds lead on Ricciardo. 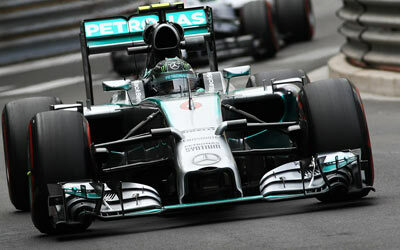 The Briton however is not interested and only wants to know the gap between himself and his team mate Rosberg. Another example of the competitiveness between the Mercedes team duo. Button overtakes Magnussen for P6 and immediately Raikkonen tries to do the same, resulting in a clash without major damage. The incident though is to be investigated by the stewards after the race. With only 2 laps to go, Ricciardo is fast approaching Lewis Hamilton. The Briton will have to be on his best to fend off the Australian. Rosberg crosses the finish line in first place. The German is followed by Lewis Hamilton, who only just manages to hold off Ricciardo. Fernando Alonso crosses the line in 4th position and stays ahead of Hulkenberg, Button, Massa, Bianchi, Grosjean and Magnussen who completes the top 10.